Getting work done in your home can mean that you have some extra materials left around the home. This can be extremely troubling, particularly if you have a gallon or two of bright paint just lying around the house. In some cases, it might not even be a gallon; it could be a small amount from a variety of different paint cans. Other than throwing them away, you might feel like there’s no other option for these little bits of paint. With no use for it in the future, you might feel like you have wasted your money in this manner. On the other hand, think of it as an opportunity to indulge in some tiny DIY projects that you might have always wanted to try your hand on. Thinking out of the box is the goal here and the following are a few fun ideas that you can try to use the leftover paint around the house. Make your kitchen picture perfect with the help of the leftover paint in your home. The best thing to do is to consider how much paint you have. If it is a little bit, it might be perfect for use on the handles of the kitchen cabinets to add a bright splash of color to your otherwise dull kitchen. Just remember to give it time to dry; otherwise, it could be a recipe for disaster and a lot of mess. 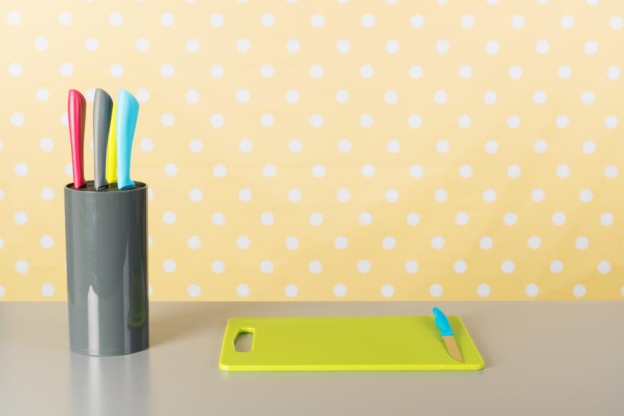 You can also opt to make use of the paint on the handles of your favorite utensils. If they’re made of wood, they are going to be perfect for this little tip. Make sure that you don’t paint too far up the handle. In some cases, it might not be a good idea to have the paint touch with food. Not all paint type is safe for use around food products, so it is better to stay on the safe side. Luckily, just painting the tips of the handles can be a great way for you to color code your cooking utensils. In this manner, you’re never going to pick up the wrong spoon or spatula when you’re cooking. Just look for the color. For a more coordinated cooking time, you can also color the containers with the matching color to ensure that all the baking utensils are in one pot and the ones for cutting are in another. If gardening is your hobby, you can make use of leftover paint in the most creative manner by color coding the gardening pots to go along with your garden furniture similar to this teak daybed outdoor collection. This will allow you to visually remember which pot contains which plant. While you might have other markers in place, painting the pot can help you identify the plant with extreme ease. When you’re going to paint the pot, it is a good idea to opt to treat the pot with some seal or varnish as well. This will ensure that the paint doesn’t start to have any problems and will not wash off from the pots. Moreover, it will also ensure that the result you get from using the paint is great. As you might be aware, any paint job relies on the surface you’re using and by treating the surface, you can ensure a smoother, better coverage as pots can be a bit porous. 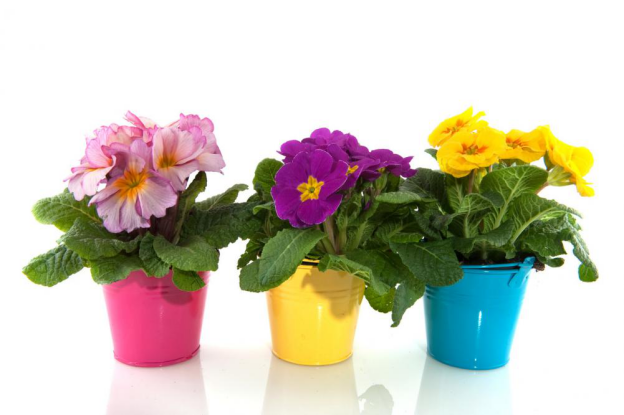 If you’re not interested in color coding the pots, let your creative side shine. Use bits and splashes of different paint to color the pots in a variety of different colors. They will be more visually attractive and the pots will look lovely, no matter where you place them. This is a good trick to use, particularly if you are planning on making use of the pot indoors or in an area where you already have a certain color scheme or theme in place. So you’ve got a gallon or more of paint left and you don’t have enough kitchen utensils or garden pots to make use of that paint? Well, it’s time to take a look at something larger items such as the old furniture that could really use a good coat of paint. If you have been thinking of throwing it away, stop and reconsider. All you need to do is sand off the old paint and give it a fresh coat of paint. In some cases, this can make your furniture look as good as new and many people love recycling their old furniture in this manner. From a tiny foot stool to a large dresser, you can make your furniture look as good as new with the help of a good coat of paint. Moreover, it allows you a degree of creative freedom as you can now make your furniture fit in with any color scheme or theme you had in mind. My sister recently painted her dingy, old shoe cabinet and it looks good as new! It’s definitely worth getting your scrubby clothes on and getting messy painting because the end product can be incredible! I’m even considering setting up a side company for refurbishing and repainting peoples furniture to give it an updated look. I will have to look into furniture courier companies though to look at the costs of moving the furniture. If a room has various shades of beige and your red dresser or table was standing out and not fitting in anywhere else, just brush it up with some leftover paint to match the walls. Not only will it fit in more easily, it will complement the color scheme too as paint on wood tends to be a shade darker and the red base will also add a touch of warmth to the end result you get. This can be rather time consuming but it allows you to not only make use of the left over paint creatively, it also gives you a chance to liven up any room with ease. While many people prefer adding paint stamps or any other form of wall art to a children’s room, you can easily make an accent wall in the living room with it as well. For this, you need to consider how much paint you have left over. 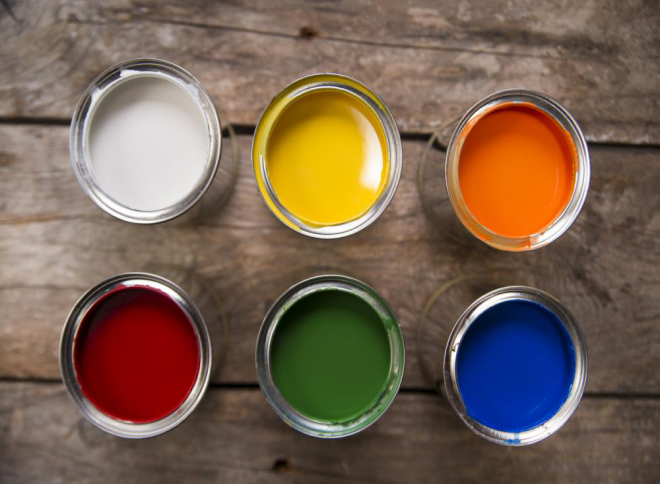 In some cases, this can turn into a full scale project and if you didn’t consider the amount of left over paint, you might end up having to buy another can or two to finish the wall art you have in mind. Nonetheless, this is a really creative option that lets you add a visual break to the monotony of your walls. Another bright thing you can do is use the paint to stencil names or shapes on boxes and small cans. This makes storage of the products so much easier and also ensures that you use up the leftover paint as prudently as possible. You will have to consider investing in making the stencil but these can easily be made with cardboard. You can also liven up a room by adding a bright wall accent that catches the eye in any room. Wall accents can be very interesting as, if you have a creative side; they allow you to express it with ease. Much like stamps, this works best if you have a stencil as it ensures that you are able to get the accent on the wall as neatly as possible. Many people tend to make wall accents in a manner that they break the monotony of the wall, add color and become the focal point of the room. Again, keep in mind that the overall amount of the paint you have to make the accent on the wall should be enough to make it as painting the wall accent can become a full task. Painting a wall accent is also more preferable than getting a sticker on the wall as it is more permanent. Don’t neglect the built-in shelves and cupboards in your home. You can use the paint that has been left over to give wonderful depth and definition to the shelves and the cupboards. Think Pinterest inspiration shelves which have white outlines and a navy blue interior if you want an idea of what we’re talking about for your shelves and cupboards. This not only looks very visually pleasing, it also gives you a perception of space. If your room is small and cramped, this can definitely be one way through which you can add more color and a feeling of space. Not a bad trick to make use of when you are on a budget and there’s surplus paint lying around the house. Whether you use it in the kitchen or in the bedroom, this trick will make a visible difference. Moreover, the interior of most shelves and cupboards tend to be locked up and neglected. It’s all too common to overlook this aspect, so be sure to avoid doing the same. Even if the shelf or cupboard is not built-in, show it some love and give it a new coat of paint to liven it up with ease. Garden furniture can also be livened up with the help of some leftover paint. 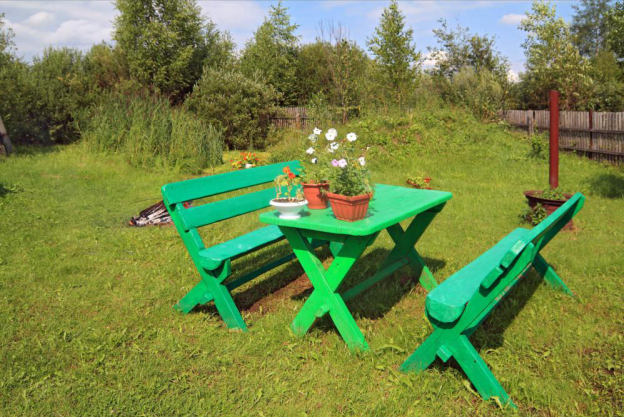 Most people tend to think that their garden furniture should be white or brown in color but if you have some bright red, blue or even yellow paint left, it is a good option to use it for your garden furniture. 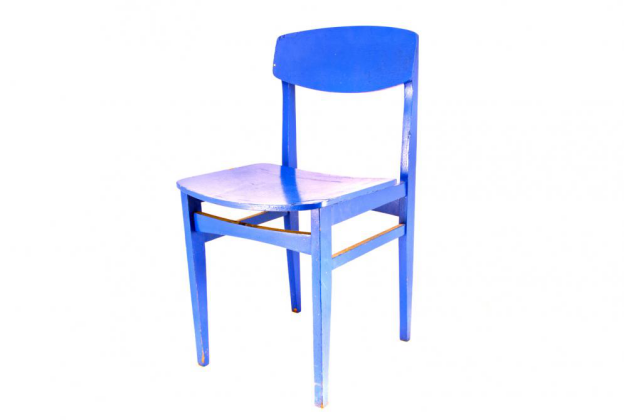 Not only will it add a splash of color, it will make the garden furniture look as good as new. Moreover, the new paint might also make the garden a favorite spot for you all over again. To really ensure that the paint will look good, you should use a sealant on top to ensure that it doesn’t suffer from weather damage too much. While most people tend to use weather resistant paint for garden furniture, it isn’t a bad option to make use of paint meant for your interiors. Moreover, you can also liven up other furniture too such as wooden step ladders, crates, planting shelves and more which will look perfect in your garden. 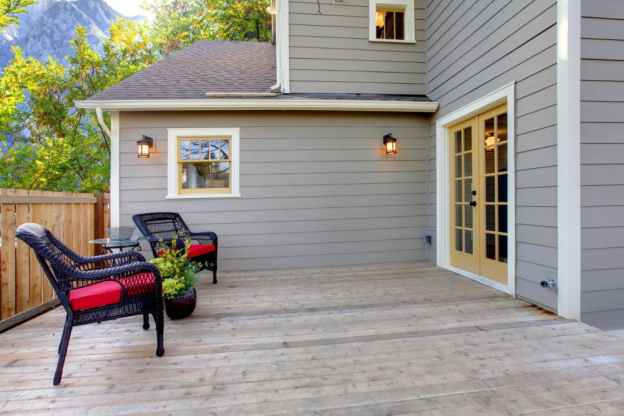 Another area of the house that can benefit from a good coat of paint is the deck or patio of your home. Since it is the first thing that people see when they come to your home, it is a good idea to ensure that you focus on keeping it neat, clean and well maintained. A new coat of paint can work wonders on rejuvenating it. While most people tend to lean towards white as the color of choice for their deck, you can make use of almost any color. Dark colors also look good on the deck as they draw the eye towards them. On the other hand, if you aren’t interested in painting your deck a certain color, you might want to consider getting it stained. While this won’t make use of the leftover pain in your home, it is a good way to make your deck look picture perfect. In either scenario, you can easily get help from some professionals to get the work finished as quickly as possible. Based on the size of the deck, this could require a lot of time. Moreover, in some cases, the deck might be just too large to make use of leftover paint, so it is a good idea to get it stained. You can then opt to give it a border with the paint to make it more unique. If you have too much paint and not enough time, get the experts on board with your paint projects. With the added bonus that their expertise will give you cleaner results, you will also get the work finished as quickly as possible. Two hands are better than one after all and no matter what project you might have in mind, the experts will always be able to help you out with ease. If you’re considering making use of professional services, get in touch with One Man and A Brush Pro Painters by calling on: 678-368-5115. Our services are perfectly crafted to meet all your painting needs. With a BBB accreditation and a stellar reputation, we are the best professionals to handle any painting job you might have in mind. Whether you need the interior painted or exterior painted or have some other DIY project in mind, we can provide you with the best results to give you your dream home.